In June 2009, thanks to LittleWit of Half-Acre Goods, I tasted the Riesling Poached Pear Sorbet at a Jeni’s Ice Creams Scoop Shop and swore I was tasting a heavenly frozen treat. Not caring that each pint cost $10 (at that time), I proceeded to purchase Jeni’s various flavors whenever I could afford them. In fact for my 40th birthday, I scrimped and pinched pennies to send myself 4 pints to share with my parents, sister’s family, and my pal Anita’s family. When I discovered that Taste Unlimited was carrying the brand in their Shore Drive location, I drove through the hectic tunnel traffic in order to get it. Since last year, The Fresh Market has been selling certain flavors, and I could not even be happier. Better yet, after attending Jeni’s Ice Creams cookbook launch party in 2011, I now have the ability to make those wonderful flavors in my home. 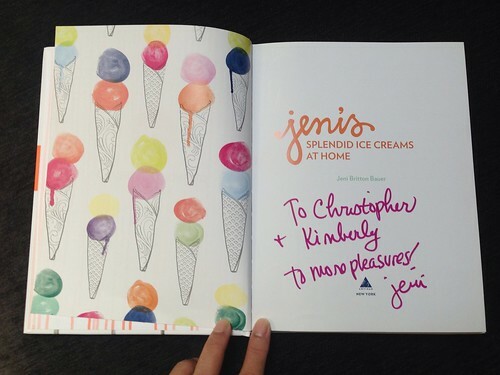 Jeni’s Ice Cream Cookbook — signed! What you see was a 3-pound block of cream cheese. 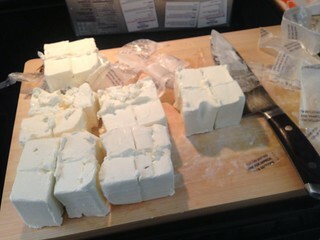 When that block is divided into 2 ounce (4 tablespoons) cubes, the result is 24. That means the possibility of 24 quarts of Jeni’s flavors to make. At first BFF was stunned at the size of the cream cheese and seemed worried about it spoiling or going to waste. Here’s when I cued the violins on the internet: cream cheese can be frozen! And for those who have not peeked at the Jeni’s Ice Creams website, Recently a single pint of Jeni’s retails between $12 (if locally available) to as much as $15 (shipping included) depending from where you get the ice cream. So not only do we (okay, the ice cream is just for myself) have enough cream cheese to last a quart per week for the rest of this year, but the realization of 48 pints at possibly $15 each equals $720. After SlytherBun’s expenses, the Medtronics insulin pump, and replacing the totaled Civic, we unfortunately do not have $720 to spend. To kick myself in gear for ice cream making, I selected “Cocoa Zin” — Jeni’s “Dark Chocolate” ice cream with zinfandel wine instead of coffee — as my first quart. 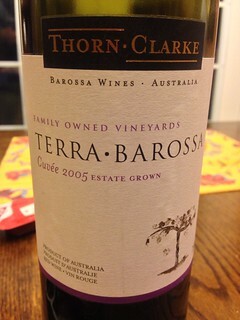 My only changes were that I used a different type of heavy red wine and 1% milk. I liked the outcome, but was not pleased with the amount of ice crystals that formed. Knowing that I needed to boost the fat content, I decided to add 1 more tablespoon of cream cheese and boil the ice cream base 2 minutes longer for my next attempt. A week later Julius left us, and we were keeping ourselves busy in our grief. As BFF mowed the lawn and chopped firewood, I puttered in the kitchen trying to figure out what to make. Taking a chance on the possible flavor, I took the “Queen City Cayenne” recipe and turned it into what I call “Gingerbread Trails” since I did not mix the chocolate (gingerbread) paste into the milk chocolate (ginger and molasses) ice cream base. The result of this flavor made me swoon like I did the first time I visited Jeni’s in Columbus. In a future post I will be sharing what I did, including the fact that I am not using an ice cream maker, but rather I adapted this hand mixer one instead. Now that I had 2 quarts under my belt, I decided to select a flavor I had never seen or tried while in Columbus. 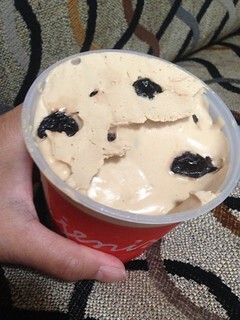 Besides, I have a LOT of Jeni’s Ice Cream pints that are begging to be filled with her various seasonal flavors. This time “Scarlet and Earl Grey” caught my eye and the idea of a creamy milk tea of Earl Grey and sweetened tart cherries had my attention. 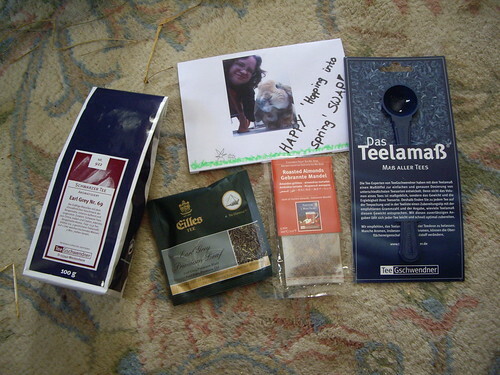 Because I still missed Julius, out of the 4 brands of loose Earl Grey we have in our tea stash, I chose the tea leaves that were in his (and mine) Bunny Swap package from Selina and Snoopy. 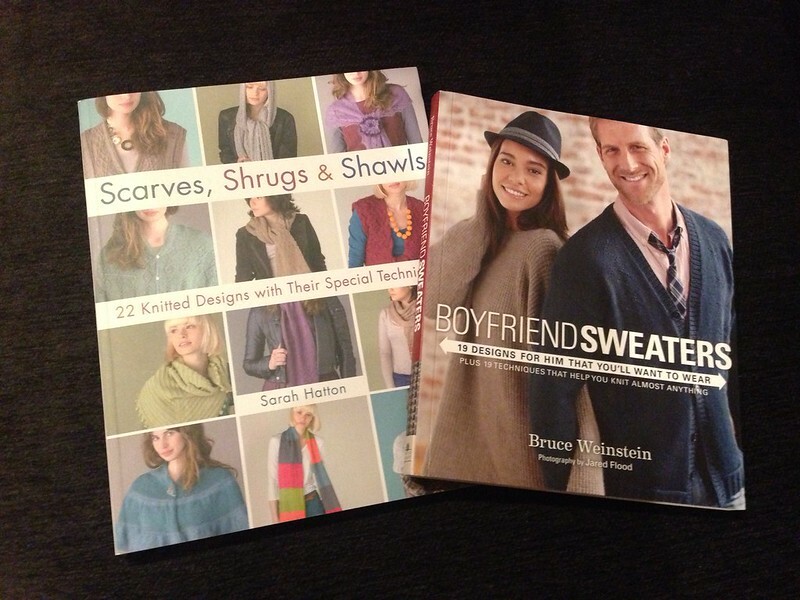 PS: There are only 11 more days until I pick 2 names to receive 1 of 2 knitting books I am giving away. So if you have advice for a new mom/dad/grandparent, we’d love to read/hear it!! Have advice for a new mom/dad? You can win a new book! Support each other by taking turns with feeding, waking up in the morning, and getting up at night. One overly tired mom does not a happy home make. Thank you for the great idea, Rusty! Currently BFF takes the evening, midnight and early morning times. Just from doing that has helped immensely!